An escaped killer terrorises a mother and her children. No Good Deed is the type of movie we don't see too often in today's world in which Hollywood is becoming increasingly unwilling to produce movies with budgets lower than the GDP of most second world nations. It's the sort of movie that was once referred to as a 'programmer', and might have starred Ida Lupino and Robert Ryan in the roles taken her by Henson and Elba. Sam Miller has made a film that's commendably old-fashioned, but at the same time, it's highly derivative. If movies like this have taught me anything, it's that should I ever need to fashion an escape from prison, the time to do so would be when I find myself being transported to or from said prison for a parole hearing, medical checkup, or funeral of a loved one. All it takes is to ask my guard for a cigarette or a tissue and I'll be conveniently presented with the chance to grab his gun from his holster. That's how Elba's psycho makes his move at the beginning of this by the numbers thriller, before visiting his ex for a bit of payback. You would think the home of his ex would be the first place the police might stake out in their search for an escaped killer, but if this movie is to be believed I'm giving American law enforcement too much credit. After a car accident on a rainy night, Elba makes his way to the suburban home of former lawyer, now bored housewife Henson, who happens to be alone with her two young kids, her husband having just left for a business trip. At first he charms her, to the extent that she fixes her hair nicely for him in the bathroom mirror. It's all going well until horny neighbour Bibb arrives with some wine and tries to get into Elba's pants. Then the movie begins to tick off the usual spam in a cabin plot points. 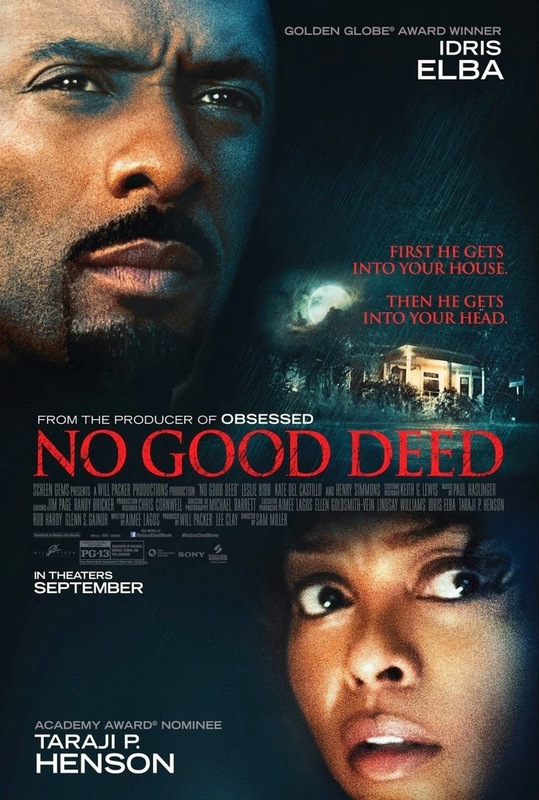 No Good Deed boasts a clever late plot twist and more interracial interactions than 10 average Hollywood movies, even if those interactions usually involve a neck snapping, but there's nothing here you haven't seen before. You just won't have seen it on a cinema screen lately.